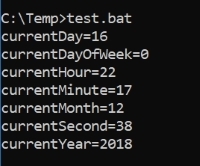 I cannot seem to get the if %day% EQU lines correct. I am trying to get the autoShutDown variable to "T" when the script is run between Friday night 8:30 PM and Saturday at 5:15 PM. But it seems like sometimes the formatting is different and causes the variable assignment to not work correctly. What's the best way to set the variable? In case it makes a difference, I have Windows 8.1. [ EDIT ] So based on what @harrymc wrote below, is the following what I should be doing? The %DATE% is not dependable, because its format is customizable and can change per each user. Not the answer you're looking for? Browse other questions tagged cmd.exe shell-script time date-time or ask your own question. Where is the Daylight saving time setting in Windows 7?